5 Web Design Mistakes Businesses Can’t Afford to Make! →5 Web Design Mistakes Businesses Can’t Afford to Make! In a hyperconnected world, businesses live and die by their online presence. Local businesses, licensed professionals, freelancers, online entrepreneurs — everyone needs to develop their own website in order to stay relevant and competitive. While building a website nowadays is easier than ever, some people aren’t exactly well-versed in the digital marketing sphere. The same can be said for self-proclaimed “freelance web designers” who heavily depend on templates and themes to get the job done. As a result, most websites fail to garner an audience, generate sales, or do anything remotely beneficial to the company that owns them. It may sound harsh, but that’s the internet for you, especially if you pursue a web development direction without being aware of the common pitfalls that can doom your success. What are these pitfalls, you ask? Don’t worry — we got you covered. 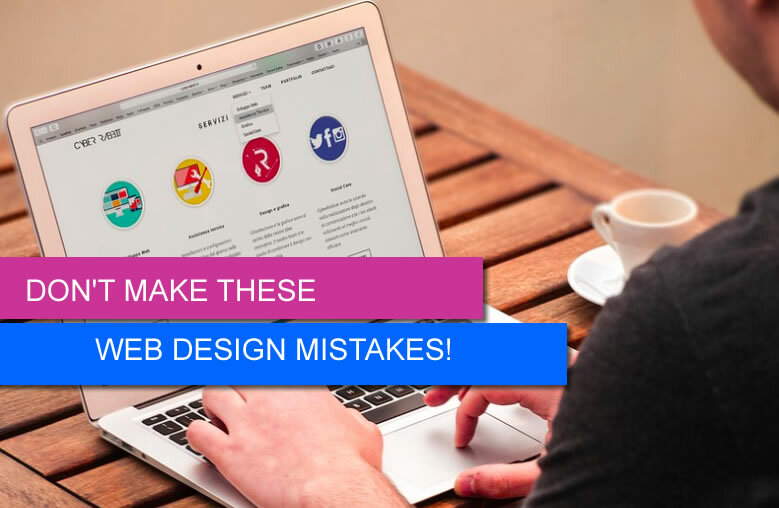 In this post, we’ll discuss the worst web design mistakes that you need to avoid at all costs. Always remember that users only care about the value they can get out of your website. They’re not there to admire your design or content writing skills — they only want to know how you can help them accomplish their goals. That’s why every single page on your website must highlight your value propositions right off the bat. Make it evident in crucial conversion elements, particularly your headline, subheadline, and call to action. Since you’re not supposed to write a long headline, you should rely on a subheadline to add more context. Describe the benefits your audience can expect or what they need to do once they decide to take action. After you pique the audience’s interest with the headline and subheadline, the call to action (CTA) must take over and seal the deal. Make sure it contrasts with the background and avoid words that add friction, such as “Register,” “Apply,” or anything that indicates a tedious conversion process. Speaking of highlighting value propositions, nothing else comes close to visual content when it comes to grabbing your audience’s attention. Research shows that colored visuals can increase readership and brand recognition by 80 percent. While minimalism and simplicity are indeed perfect for maximizing the readability of your content, plenty of novice web designers take it too far. Most of them end up with bland, monochrome websites that’s downright unappealing. That said, don’t be afraid to incorporate an ample amount of visual content into your website. It doesn’t have to be over the top — simple infographics, for example, should be more than enough to make your value propositions and unique selling points more presentable. They can also be used to make statistics and other data-driven information more digestible. Of course, the output of professional graphic designers should still be superior to what you can concoct with free, drag-and-drop tools. But since Canva is free, it should give you enough breathing space as you try and allocate a budget for visual content. After spicing up your website with visuals, your next priority is to make sure they don’t compromise your website’s loading speed. Bear in mind that assets like images and custom codes take up precious bandwidth as a website loads. The larger these files are, the more bandwidth a website consumes to be loaded properly. To keep your website’s performance consistent, use compression tools like TinyPNG, Compressor.io, or Minify Code to shrink the file sizes of images and various types of codes. If you cater to users from all around the world, consider leveraging a Content Delivery Network (CDN) to optimize the transfer of website data. A CDN reduces latency by distributing the load of content delivery across multiple proxy servers. In case you didn’t know, mobile users now account for more internet traffic than those on desktops. This means it’s about time for you to adopt a “mobile-first” approach when structuring your web pages. The good news is, most website platforms and content management systems (CMS) mostly feature responsive themes and templates, which means they automatically adjust to match the size of the display being used. Still, you should use the mobile-friendly test feature on the Google Search Console to receive more insights and suggestions on how you can improve the experience of mobile users. Finally, a lot of website owners have a “lone wolf” mindset when tackling the challenges of website development. It’s true that, given enough time, any person can learn the ropes and be reasonably competent with every aspect of web design — thanks to the wealth of learning resources available online. But if you really want your website to stand out, you need to kick the “one-man-army” mentality and forge connections with professionals who can help you. Hire freelancers or consultants to fill the knowledge and skill gaps that prevent you from building the best site possible. You should also consider outsourcing content developers to keep your website supplied with fresh, engaging posts for your target audience. To start looking for the manpower that can attend to your needs, you can depend on freelancing marketplaces like Upwork or Fiverr. You can also post listings on websites like Craigslist to cast a wide net. Having a website up and running is only a small step towards an authoritative online presence. What you need is to adopt the fundamental marketing philosophies and apply them whenever you make pivotal design decisions. Understanding the mistakes listed above is a step in the right direction. Just be patient, focus on one thing at a time, and remember that success never comes overnight. Are you guilty of any of the mistakes above? What advice can you give other readers who face the same issues? Whatever your thoughts, feel free to leave a comment below! Marc lives and breathes writing. He writes about marketing, business, sports, cybersecurity, or just about anything and everything under the sun. Great tips indeed. There are many web design mistakes, even professionals do, which can ruin the whole design of your site. Almost all the major mistakes you have mentioned in the article. I think too much creativeness can be a problem. Sometimes users will prefer a site with an clean intuitive interface, smooth performance, and legible, eye-pleasing overall look. by the way nice article. I’m with you on the whole “clean intuitive interface” bit. Medium.com is a classic example. Reading articles at Medium is such a painless experience because there’s not much on there to distract the readers — they don’t even have a sidebar. The tricky bit is finding the sweet spot between removing a bunch of elements and keeping those that are crucial (and this varies depending on the goal of the webmaster). Yes, I would agree too much creativeness can overtake a website. Clean, simple and easy design is best today. No big flashes or music in the background. Anything that can help with a site’s speed is another huge factor. I have to work on those attention getting headlines. Thanks for the advice Marc! You’re welcome, Lisa. It’s my pleasure. Back in the day, it was far easier to come up with headlines that would compel others to click. With all the click-bait headlines popping like mushrooms on social media, it’s like people are experiencing banner blindness (but for headlines). Speed is more important than ever Marc. Folks need sites to load fast because we are in a mobile, I want it yesterday type world. Just the way it is. If you ignore speed you are toast. I do not bother reading and commenting on heavy, slow-loading sites. Waste of time. I Xed a few from my list over the past few days because I simply have no time to wait for 3-5 seconds – or longer – for these sites to load. Rocking post dude. I do the same. 3 – 5 seconds just feels like forever. You laid out nicely and all of the points you mentioned are important. Headline, sub headline and CTA are important, but I think even more so for mobile users. Chances are, they want information much quicker than desktop users and tend to be impatient. Agree? Thanks for dropping by. I appreciate the pat on the back. I absolutely agree. You hit the nail on the head about the mobile users. After all, people using mobile devices are most likely on the go (especially at certain times of the day). If we delay them needlessly or give them a poor experience, they’ll most likely just click away. Good to know about all these Design Mistakes that may harm for a Business. Thanks for making aware of these Designing Mistakes with this post. Thanks for the great tips and information! These are not to be overlooked. As mentioned above, speed is super important. Also, being responsive on Mobile and all digital devices is very imperative. Google AMP is an option that many developers are flowing toward. I appreciate you pointing out having attention getting headlines. Something for me to improve upon. Also, a good CTA should be integrated. User friendly, a mix of quality images, and simplicity has worked well for me! Look forward to sharing this. You’re right! I have to admit that despite being a full-time writer, my team and I sometimes still struggle with coming up with the best headlines. At the end of the day, it all boils down to applying tried and tested strategies, then split testing. It is only through split testing when we’ll know for sure if we have a winner — or not. Thanks for sharing an informative post. I totally agree with you that too much creativeness can overtake the website apart from this keep your web design simple and easy. Site speed is a huge factor nowadays. So, keep your design responsive and also checks that site speed. Use AMP for the faster load for a site in a mobile device. Thanks for dropping by. You hit the nail on the head with the whole “creativeness can overtake the website” bit. As web designers, we need to align our designs with the goals of the website owner. If the owner’s main CTA is to generate leads, then our designs and creativity should help further that end goal. If not, our creativity will only distract readers, ultimately hurting our clients. I don’t quite agree with point 2. Being simple and minimalistic is what is needed now. Too many online businesses are filled with too much content on their pages. Identify the top 20% of what works for individual customers using data mining and put just that. Thanks for dropping by. We’re all for being minimalistic and applying the Pareto principle when it comes to figuring out what to add (or what not to add) on a website — while split testing. in the online Internet sauce. Your five suggestions are incredibly practical. in order to continuously grow! And no one can or should be trying to do it all! Excellent advice and extremely practical. into a free 90 -120 minute, offline, lead magnet introductory workshop! and start up entrepreneurs.If you haven’t already started doing so.